As the city with the first all professional baseball team, we Cincinnatians take our baseball very seriously. We cherish Opening Day, and treat it like a holiday. Heck, some of us even skip work to go to the game or participate in all the festivities. With all that will be happening downtown on Monday, we know that it can be hard to track down all the details. Fear not. Below you will find a step-by-step guide that will help you make the most of Cincinnati’s other spring holiday. Each year to celebrate the return of spring and the start of the baseball season, Fountain Square hosts a ceremony in which the water in the fountain will be turned back on. This year’s Fountain Day will be this Saturday from 6pm to 9pm. Food and drinks will be available for purchase. The event is free and open to the public. Rock cover band 4th Day Echo and Local 12’s “Good Morning Cincinnati” anchor Bob Herzog will provide entertainment throughout the evening. The water will ceremoniously begin flowing from the Genius of Water on the Tyler Davidson Fountain around 7:45pm after an official announcement by Cincinnati Vice Mayor Roxanne Qualls. Fireworks sponsored by Cincinnati-based Procter & Gamble are planned to follow. 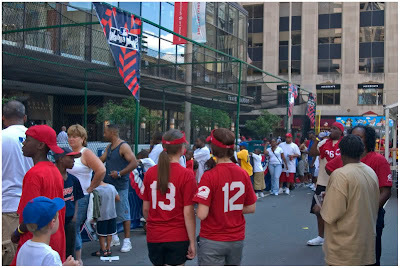 An unparalleled Cincinnati tradition, the 91st annual Findlay Market Opening Day Parade will be held Monday, April 5th. The parade begins at the Race Street entrance of historic Findlay Market at 10:30am and will proceed south on Race before turning east on 5th Street past Fountain Square. 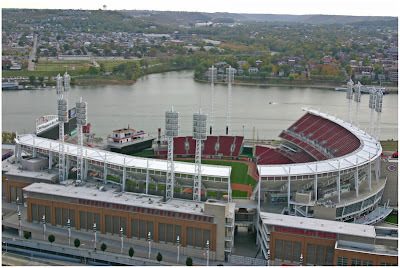 It will end at the corner of 5th & Sycamore streets, just steps from Great American Ball Park. You can plan your location along the parade route now, but be sure to get there early for the best spots. This year’s Grand Marshal will be none other than legendary Reds Hall of Fame catcher Johnny Bench. Mr. Bench will be joined by the retired FOX Sports Ohio play-by-play announcer George Grande, Miss Ohio Amanda Tempel, Reds pitcher Bronson Arroyo, and a host of other legendary Cincinnatians, including Mr. Cincinnati himself, Jim Tarbell. All day beginning at 9am, Fountain Square will serve as the hub of all activity. The traditional Findlay Market Opening Day Parade passes by the Square in the late morning, and there will be giveaways and activities throughout the day from Local 12, Q102, PNC Bank, H Meyer Dairy, Servatii Pastry Shop, Skyline Chili, Eichler Golf Cars, Crock of Love, and Cincinnati Tan. Fountain Square’s video screen will broadcast the game live beginning with the first pitch at 1:10pm. Young professionals from Give Back Cincinnati will be hosting a party on Fountain Square that will last into the evening. Live music from Charlie Hustle, The Symphonics, and Jason Ludwig & Hannah Ray will be joined by food from Mythos Grecian Grill and Senor Roy’s Taco Patrol. Christian Moerlein beer will also be available for consumption. Reds fans enjoy an expanded Fountain Square on 5th Street during last year’s Civil Rights Game [LEFT]. 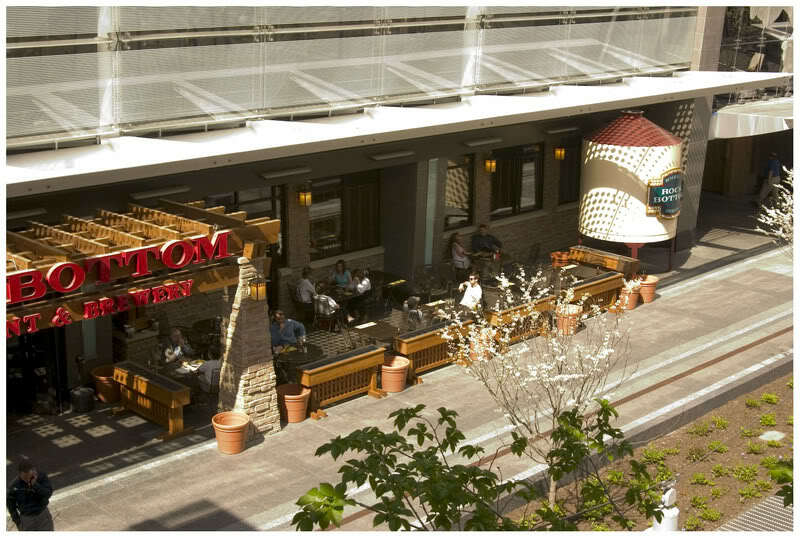 People relax on Rock Bottom Brewery’s comfortable outdoor patio on Fountain Square [RIGHT]. 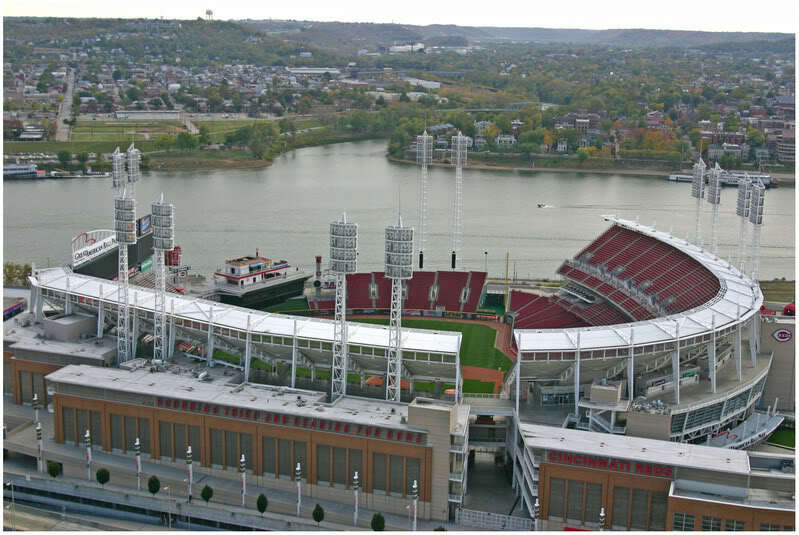 Gates to Great American Ball Park will open at 11:10am, and early fans will be treated to live music from The Goshorn Brothers and Pete Wagner Dixieland Band who are scheduled to perform pregame concerts in the ballpark. Honor Guard units from the Navy, Air Force, Marines, Army and Coast Guard will comprise a Parade of Colors on the field. Four F-16’s from the 178th Fighter Wing of the Ohio Air National Guard based in Springfield, Ohio will perform a pregame flyover. Haiti Relief volunteers from the American Red Cross and Matthew 25: Ministries will hold a giant American flag in the outfield during the singing of our National Anthem. Recording artist, former Bengals tight end and 2006 Super Bowl Champion Ben Utecht will sing the National Anthem before the game. Saxophonist Elan Trotman will perform God Bless America during the 7th inning stretch. Miss Ohio USA 2010 Amanda Tempel, St. Bernard native and Roger Bacon High School alum, will deliver the official game ball to the mound to be used by Opening Day starting pitcher Aaron Harang who will deliver the first pitch of the 2010 Reds baseball season at 1:10pm. Just before that, the ceremonial First Pitch will be thrown by former Reds broadcaster, George Grande who was the television play-by-play voice of the Reds for the past 17 years, and is scheduled to return to the booth in September for a few games. One of the few things that Cincinnatians have historically taken as serious as baseball is beer which Cincinnatians consumed to the tune of 40 gallons per person every year in the early 1900s. Much of our city’s architecture was built to facilitate brewing and many of those beautiful structures remain as a reminder to this day. It is only fitting that the Findlay Market Opening Day Parade begins in Cincinnati’s historic Brewery District. Seldom will you find a gathering that does not include the enjoyment of this great fermented malt nectar, if in fact the event was not planned only to provide the excuse to savor a craft beer in the first place. When Baseball and Beer combine forces on Opening Day, there is no truer representation of Cincinnati’s passions. In fact, in 1880 the Cincinnati Reds were kicked out of the National League in part because they refused to stop selling beer during baseball games. Sprinkle in some beautiful weather and it truly nears perfection. Before the game starts there will be a variety of pregame places to check out for the special events. Arnold’s Bar & Grill (210 E. 8th St) is Cincinnati’s oldest tavern and is an Opening Day staple that will feature a litany of events. The all day long Jake Speed’s Opening Day Extravaganza is presented by WNKU and Hudy will include special menus, live music, giveaways, and more. JeanRo Bistro (413 Vine St) will open at 9am with brunch and $3 drafts of craft beer from a great rotating tap selection. In the Backstage Entertainment District, Nicholsons (625 Walnut) will open at 10am and offer ballpark food (dogs & burgers etc) and 25 total taps including two special releases in Cask (hand drawn, British Pub Style). A limited amount of the hard to get 21st Amendment “Monk’s Blood” Dark Belgian-style Ale may still be available. 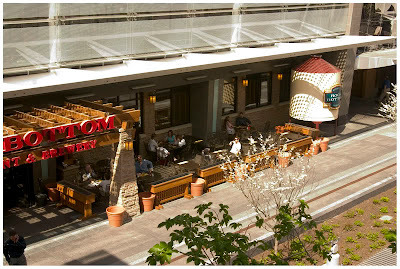 Rock Bottom Brewery (Fountain Square) will have brewmaster Mitchell Dougherty tap his “Catcher In The Rye” Ale in honor of the new baseball season. They will open at 9am for breakfast, and will be serving locally brewed beers all day inside and on their patio space directly on Fountain Square. At the ballpark itself, the powers that be have made a concerted effort to make craft beer offerings more available to all areas of the stadium, including well placed taps of Bells Brewery’s Oberon American Wheat, which is widely known as “Baseball Beer.” Bells will also have their Oberon on tap in sections 110, 140, 430 and 419. Christian Moerlein’s OTR Pale Ale will be available in Sections 135, 110, 140 and 430, while Moerlein’s Lagerhouse Helles will be available in sections 126 and 104. Great Lakes Burning River Pale Ale will be available in Club Red and section 135. In addition to these great draft selections, there are other notable beers available in cans and bottles at the The Pub, Machine Room, Scouts Alley and the Champion’s Club, including beers from local brewery Mt. Carmel, as well as Great Lakes and a brewery that is brand new to the state of Ohio, 21st Amendment. This Bay Area, CA microbrewery will be offering both “Brew Free or Die” IPA and “Hell or High WaterMelon” Wheat in its signature cans. For your post game fun it will depend on the direction you are heading, but Hoperatives has a great list of options to continue your appreciation of craft beer throughout the Greater Cincinnati area. Wherever the rest of your day may take you, please be safe and responsible and make it a point to use public transportation, hail a cab, plan for a designated driver or even grab a hotel room downtown. Enjoy yourself on this true Cincinnati celebration. Cheers! David Ben, Dave Rolfes, Bryon Martin & Randy Simes all contributed to this story.